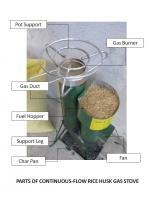 Attached are the info on the latest development on rice husk gas stove in India. Just to update you that rice husk gas stove is now being commercialized by Navdurga Metal Industries of India. The three-year-old startup based at Faizabad in Uttar Pradesh has created rice husk-powered, smokeless biomass cooking stoves that significantly reduce the cost of household spending on conventional fuel sources such as LPG, electricity, kerosene, wood and wood charcoal. "Rice husks can give about 3,000 kilo calorie of energy, compared with wood that gives between 3,800 and 4,000. These stoves reduce carbon emissions, and cooking costs significantly," said Jaiswal, 31. 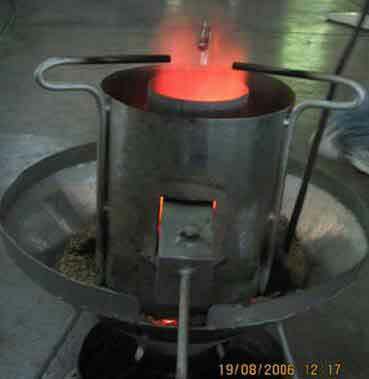 Nav Durga's first product, aptly named Janta Chulha Smokeless Stove, was launched in 2009 and priced at Rs 500. It has now launched a range under the brand name, Agni, which caters to both domestic and industrial customers. "We currently manufacture up to domestic 10,000 cook stoves and about 50 commercial stoves a month. We want to ramp that up to 20,000 domestic and up to 1,000 commercial stoves soon," Jaiswal said. According to recent industry data, about 67% of Indian households, adding up to about 166 million households, continue to use solid fuels as their primary source of cooking fuel. While conversion to modern fuels has accelerated in urban areas, rural areas have been slow. Saurabh and the firm's co-founder Arvind Jaiswal, 56, have set up their own distribution and supply chain system. The startup currently has about 50 distributors spread across Uttar Pradesh, Bihar, Assam and Punjab. The company employs about 50, spread across two facilities in Faizabad and Faridabad, in Haryana. "The manufacturing is done by local talent alone," Jaiswal said. The original news article, and instructions sheets for the stoves are attached as pdf files.